These cars are amongst the world’s fastest production sedans, giving performance, handling and comfort at half the cost of their European equivalent. All this whilst maintaining their identity as Australian cars built for Australian conditions. * Driver Training, plus many other activities. The main aim of the Club is to create interest for all members on more than one level and that their families can also find excitement and enjoyment in the Club’s activities. Hence the motto of HDT Special Vehicles, “We Build Excitement”, evolved into our club motto, “We Drive Excitement”. The NSW Branch of the HDT Owners’ Club was formed in 1985 with eligibility for membership being open only to owners of vehicles improved by the former HDT Special Vehicles Pty. Ltd. 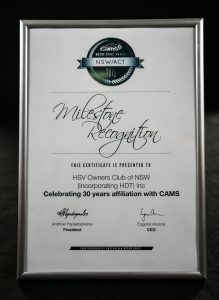 In 1988 membership was extended to owners of Commodore and Statesman models enhanced by Holden Special Vehicles, and in 1991 the club changed its name to the HDT-HSV Owners’ Club of N.S.W. 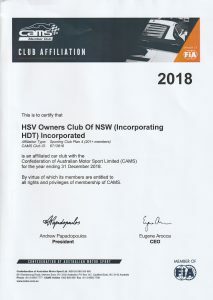 2001 saw another name change and it is now named the HSV Owners Club of NSW (incorporating HDT) Inc. This change was made to bring unity to all HSV Owners Clubs around Australia and New Zealand. Owners of genuine HDT or HSV plated vehicles are eligible to join the Club. The owner must present the car on the request of the Committee (if required) to substantiate the eligibility of the vehicle. HDT cars built after the Peter Brock ownership of the HDT company are not eligible, which means only HDT cars with a build plate number 4246 or earlier are eligible. If a vehicle is a VC or VH series but does not bear a HDT plate, it may be eligible to be plated. These vehicles are eligible for membership of the Club. In 2019 the Club voted to accept Chevrolet vehicles bearing an HSV build plate. There are several levels of membership available to suit everybody’s ownership and participation requirements. New members can join for either 1 year or 3 years. A 3 year membership will make a saving in membership fees and also save having to go through the renewal process for the next two years! Single Full Membership ($90 pa / $240 3 yr subscription) is for an owner of a genuine qualifying vehicle, while Family Membership ($100 pa / $270 3 yr subscription) has the same benefits as Full Membership but includes the member’s partner and children under 18 for only a slight additional cost. With Family Membership, all the family can enjoy the Club benefits such as discounts on Events and entry into Car Shows. Associate Membership ($75 pa / $195 3 yr subscription) is available for previous full members who no longer own a qualifying vehicle but wish to continue their association with the Club, while Special Associate Membership ($75 pa / $195 3 yr subscription) is available to owners of non qualifying vehicles who would like to participate in Club Supersprints. There is a “once only” joining fee of $40.00 and this includes a free club polo shirt valued at more than the joining fee! It is easy to join online, just click here to Register and create your Account and Log in, then once you have logged in, please click here and choose the membership level that you want. Monthly Meetings are usually held on the first Tuesday of each month (except January) commencing 8:00pm in the ARDC Hinxman Room (on top of pits, at the control tower end), Eastern Creek Raceway, Ferrers Road, Eastern Creek. Entry via Ferrers Road and Gate 7. The Club has been a Sporting Club affiliated with CAMS since 1985 and achieved it’s 30 year milestone in 2015. The Club is active in supporting CAMS and holds it’s Annual Club Motorsport Championships in conjunction with the CAMS NSW Supersprint Championships. Please click here for more information about these Championships. 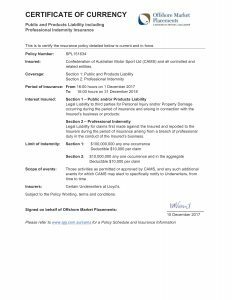 Club members are covered at Club events through CAMS Public Liability Insurance, the Certificate of Currency is shown below. The Club encourages members to participate in CAMS events whether as a competitor or official. Two Club members (Brett Gilles and Ian Williams) have chaired the CAMS NSW Supersprint Panel and Ian Williams is currently an elected member of the CAMS NSW State Council Executive, the body that oversees CAMS activities in this State.